For other people with the same name, see Robert Allison. Statistics current as of December 22, 2012. Robert Arthur Allison (born December 3, 1937) is a former American professional stock car racing driver and owner. Named one of NASCAR's 50 greatest drivers, he was the 1983 Winston Cup champion and won the Daytona 500 three times in 1978, 1982, and 1988. His two sons, Clifford and Davey Allison, followed him into racing, and both died within a year of each other. Allison was born December 3, 1937 in Miami, FL. He entered his first race as a senior at Archbishop Curley-Notre Dame High School in Miami. Since he was only 17, he had to have his parents' permission so he thought when his mother approved, it was forever, but she thought it was for only one race. After graduating high school in 1955, Allison's mother thought she would derail his racing interest by sending him to Wisconsin to work for Mercury Outboard Motors, where her brother-in-law, Jimmy Hallett, was the national sales manager. Unbeknownst to her, Carl Kiekhaefer was the owner of Mercury Outboard Motors, where Allison ended up working as a mechanic and an engine tester. Carl Kiekhaefer also owned racecars. While employed at Mercury Outboard Motors, Allison worked in the boat division for 10 months, then was transferred to the racecar division. During the 2 months he worked in the racecar division for Carl Kiekhaefer, he went to 19 races—mostly Grand National (today known as the Monster Energy NASCAR Cup Series), and a few Convertible races. Every one of those races was won by a Carl Kiekhaefer car from the shop in which he worked. Kiekhaefer was a hard person to work for and several people got fired, so Allison decided to go back to Miami only after a little over 2 months. In 1956, having returned to Miami, Allison started his own racing again. His parents said he couldn't race and live at home, so Allison came up with a fictitious name (Bob Sunderman) which was used only once as he finished well enough to make the Sunday paper. Allison's father saw the paper and told him that if he was going to race to do it with honor and use his own name. In 1959, Allison took his brother, Donnie, Kenny Andrews—who owned a car (whose father owned Andy Racing Wheels) and Gil Hearne went along as Kenny's driver on a quest for more lucrative racing than was available in South Florida. Their searching led them to Montgomery Motor Speedway in Montgomery, Alabama, where he was told of a race that very night in Midfield, Alabama near Birmingham. Allison entered and finished 5th in that race, which paid more than finishing 2nd in any big race in South Florida. He went to Montgomery the next night, won the preliminary races, and finished 2nd in the feature, winning $400, having found his lucrative racing. The brothers returned home and Bobby talked his friend Red Farmer into coming back to Alabama with him. They had immediate success and soon they began answering to the name The Alabama Gang. Allison became a known driver and won the national championship in the modified special division in 1962. Allison moved full-time to the Grand National circuit in 1965 and got his first victory at Oxford Plains Speedway on July 12, 1966. During the course of his career, Bobby Allison accumulated 84 credited victories and 2 uncredited victories making him fourth all-time, tied with Darrell Waltrip, including three victories at the Daytona 500 in 1978, 1982 and 1988, where he finished one-two with his son, Davey Allison. In 1972 he was voted national Driver of the Year for winning ten races and taking 11 poles (including a record 5 straight) and again in 1983 when he claimed his only championship. He was NASCAR Winston Cup Champion in 1983 driving for DiGard Racing. The 1982 Daytona 500 was fraught with controversy that became known as "Bumpergate". He also won the Firecracker 400 in 1982, making Allison the fourth driver to sweep both Sprint Cup point races at Daytona in the same year. Of note, after Allison accomplished this, no driver repeated such a feat until Jimmie Johnson did it in 2013. Allison ran in the Indianapolis 500 twice, with a best finish of 25th in 1975. His NASCAR team owners included DiGard, Junior Johnson & Associates, and Roger Penske, for whom Allison scored four of the five NASCAR wins for American Motors' Matador. The other AMC victory was accomplished by Mark Donohue also racing for Penske in 1973 at Riverside. He raced in NASCAR as a driver/owner of an AMC Matador. Allison was involved in an accident at Talladega in May 1987, that saw his car cut down a tire, turn sideways and go airborne into the protective catch fence that separates the speedway from the grandstands. The impact, at over 200 miles per hour (320 km/h), tore out over 100 yards of fencing. Parts and pieces of the car went flying into the grandstand injuring several spectators. This was the same race where Bill Elliott had set the all-time qualifying record at 212 mph (341 km/h). NASCAR then mandated smaller carburetors for the remaining 1987 events at Talladega and Daytona. The following year, NASCAR mandated restrictor plates at Daytona and Talladega to keep speeds under 200 miles per hour (320 km/h). Allison won the first Daytona 500 run with restrictor plates in February 1988 by a car length over his son Davey Allison, rendering him the first driver to have won the Daytona 500 both with and without restrictor plates. He is the oldest driver (50 years) ever to win the Daytona 500. Bobby and Davey Allison are the first one-two father/son finish in the Daytona 500. As a result of permanent injuries in a crash at Pocono (see below), Bobby now has no memory of the final win of his career or of celebrating together with his son in victory lane. He was elected to the NASCAR Hall of Fame in 2011. Early in the 1979 Daytona 500, Bobby, his brother Donnie and rival Cale Yarborough tangled early in the race. Donnie led the second half of the race while Yarborough made up his lost laps through caution periods. By the time there were 8 laps to go, Yarborough reached second place and set his eyes on passing Donnie. Bobby was two laps down and was 1/4 mile ahead of the two rivals as Yarborough and Donnie crashed on the final lap. Richard Petty went by and won the race. Bobby passed the wreckage, finished the race, and on his way back around Bobby stopped to check on his brother and make sure he wasn't hurt. He pulled over to the wreck site to offer Donnie a ride to the garage area. Cale Yarborough ran up to Bobby and, according to Bobby, Cale was yelling that Bobby was at fault and hit him in the face with his helmet—cutting his nose and his lip. Bobby climbed out and a fist-fight broke out. This fight led to a $6,000 fine for each Yarborough and the Allison brothers. It brought NASCAR onto the map and NASCAR became a popular sport. In 2000 when asked about the fist-fight Bobby said "I stopped to offer Donnie a ride to the garages and Cale comes running up saying I caused the wreck. I tried to tell him he had the wrong person. And I've said before, I think I questioned his ancestry. He hit me in the face with his helmet and I saw blood dripping onto my shirt. I thought 'If I don't stop this I'll be running from Cale for the rest of my life.' I climbed out and throttled him. He ran his nose into my fist several times. My story and I'm sticking to it forever. He never challenged me again. The fine surprised me, but the fact that it brought NASCAR onto the map makes it all worth every penny." To this day, Allison maintains that Yarborough was "beating his face on my fist". Donnie had a similar story to Bobby: "Cale said I forced him in the mud. I did not. He wrecked himself and I was the unfortunate bystander to be in it. He and I have talked. We're fine. We both view it as lost opportunities. After he and I talked it out and agreed to disagree Bobby came to the crash site asking me if I wanted a ride. Somehow I don't remember...but seconds later fists were thrown between Cale and Bobby. I tried to get into the fight and got scratched in the cheek by Cale. I later kicked him when Bobby mopped him into the mud. All of us were fined $6,000 but between Daytona 500 and this fight, today it's worth every penny to be involved in a fight that got NASCAR on the map." Cale Yarborough unsurprisingly has a different account of the story: "If they look at the video they'll realize I was forced in the mud by Donnie. I was going to pass Donnie and win the race but he forced me in the mud and I had no control. So hell I hit him back. If I wouldn't finish the race neither would he. He and I had a civil talk after the wreck and we were fine until Bobby Allison climbed out of the car and began shouting at me. It went chaotic from there." According to the three during an interview in 2012 at the NASCAR Hall of Fame, NASCAR later refunded the fines as a reward to them for bringing NASCAR into national spotlights. Bobby however complains to this day that because he only made $4,000 in the race, he had his wife Judy help pay the fine (by contributing $2,000) & he was only refunded with $4,000 by officials. On June 19, 1988, at the midpoint of the 1988 season, Allison crashed on lap 1 of the Miller High Life 500. Initially he survived a head-on hit into the outside barrier but then suddenly Jocko Maggiacomo t-boned Allison in the driver's side of the car, nearly killing Allison. When he reached a local hospital he was initially declared dead, but subsequent medical assistance saved his life. Beginning from a vegetative state, Allison entered a rehab program. As a result of his massive injuries he retired from driving in NASCAR. In 1992 his younger son, Clifford Allison, was fatally injured in a practice crash for the NASCAR Busch Series race (now Xfinity Series) at Michigan International Speedway. 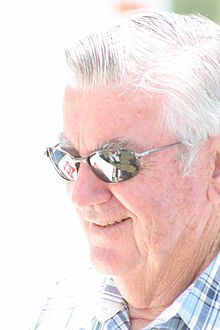 Bobby Allison was elected to the International Motorsports Hall of Fame in 1993. Later in 1993, his son Davey was killed in a helicopter accident at Talladega Superspeedway. Three years after these major tragedies, he and his wife Judy divorced. Four years after their divorce, while attending their daughter-in-law's wedding, they reconnected. They were remarried in July 2000 and remained together until her death in 2015. He was inducted into the Motorsports Hall of Fame of America in 1992, and inducted into the NASCAR Hall of Fame in May 2011, along with Lee Petty, Bud Moore, David Pearson, and Ned Jarrett. Allison is one of eight drivers to have won what was then considered a career Grand Slam (an unofficial term) by winning the sport's four majors: the Daytona 500, the Winston 500, the Coca-Cola 600, and the Southern 500. Only seven other drivers have accomplished this feat: Richard Petty, David Pearson, Darrell Waltrip, Dale Earnhardt, Jeff Gordon, Jimmie Johnson, and Buddy Baker. Due to reduced sponsorship money being given out by the "Big Three" automobile companies in Detroit, some Winston Cup teams chose not to enter some of the smaller prize-money races of the large 48-event season (only 14 cars entered the 1971 Space City 300), leading NASCAR to allow its "minor league" Grand American Series drivers (itself suffering from a massive decrease in events versus its 1970 season) to enter six of the Winston Cup races. For these races, Grand American Series "pony cars", such as the Chevrolet Camaro, Ford Mustang, and AMC Javelin, were competing against the larger Grand National Series cars, featuring the Chevrolet Chevelle, Ford Torino Talladega, Dodge Charger Daytona, and Plymouth Roadrunner Superbird. The 1971 Myers Brothers 250 was held August 6, 1971 at Bowman Gray Stadium in Winston-Salem, North Carolina. The first car to cross the finish line after 250 laps was driven by Allison. Knowing that the pony car would handle better on the flat track of that race, and the race following at West Virginia International Speedway, Allison had chosen to race his Grand American 1970 Ford Mustang, No. 49, sponsored by Rollins Leasing, and owned by Melvin Joseph. (Joseph was the head of Dover International Speedway until his death in 2005.) As he was not racing in a Grand National car, he never received credit in that series, but was credited with a Grand American Series win. NASCAR has had co-sanctioned races with various series in the past; in such cases, the win counts only in the series which that driver's car was sanctioned. The driver tied with Allison in all-time Cup wins because of the dispute is involved in this incident. An Automobile Racing Club of America/Winston West combination race in College Station, Texas on March 21, 1993, was won by Darrell Waltrip, driving an ARCA entry. That win was credited as an ARCA win only, and not counted in the NASCAR K&N Pro Series West (as it is currently known) win list. Likewise, when a Winston Cup driver won a Winston Cup/Winston West combination race, the win counts in Cup, not West. The Busch Series and Busch North Series also raced combination races in the past. Currently, Bristol Motor Speedway has such a race, with the Whelen Modified Tour and Whelen Southern Modified Tour. In the 1973 National 500 at Charlotte Motor Speedway, Allison protested that the engines in winner Cale Yarborough's and second-place Richard Petty's cars were over-sized. NASCAR inspected all three of the top finishers, and Allison's engine fit the cubic-displacement specs. Six hours after the inspections began, NASCAR technical director Bill Gazaway told the press that the results were being sent to headquarters in Daytona for a final decision. Monday afternoon NASCAR released a statement saying that, because the inspection facilities at Charlotte were inadequate, the pre-race inspection numbers would be used-when all three cars were legal and that the results would stand. Allison threatened both to quit and to sue. It was not until after a private meeting with NASCAR President Bill France, Jr., a week later that Allison was assuaged. Speculation was that Allison had been bought off. Allison wouldn't confirm or deny it, saying only that he had “received satisfactory restitution”. The results were never changed. 1973 was a transition year in NASCAR. Teams could run a restrictor plate-equipped 7-liter engine or a 5.9 liter engine without restrictor plates. A decade later, Petty's over sized engine at the same race resulted in new NASCAR rules being implemented against oversized engines, including the possibility of twelve-week suspensions for the offending engine builder, driver, and car owner. in 1985 Bobby decided to set up his own team, Bobby Allison Racing. Bobby was a car owner for numerous drivers from 1990 to 1996, most notably Mike Alexander, Hut Stricklin, Jimmy Spencer, and Derrike Cope. Stricklin was Donnie Allison's son-in-law. The car number raced was No. 12 and sponsors included Raybestos Brakes from 1990–92 and, in 1993, Meineke. Stricklin moved to the Junior Johnson team halfway through 1992 and Raybestos left at the end of the year to the Stavola Brothers No. 8 team. For 1995 and 1996, the team was sponsored by Mane 'n Tail with Derrike Cope at the wheel. Allison was forced to close down the team due to financial problems after the 1996 season. Allison has actively promoted rail safety for the CSX "Keep on Living" campaign with appearances at Talladega and Daytona. On March 6, 2008, his mother, Kittie Allison, died at age 101 in Charlotte, North Carolina. On May 23, 2011, Bobby Allison was inducted into the NASCAR Hall of Fame. Judy Allison, Bobby's wife of 55 years, died December 18, 2015 following complications from surgery. ^ a b c d e f Poole, Francis (2002) . Dawson, Dawn P. (ed.). Great Athletes. 1 (Revised ed.). Salem Press. pp. 46–48. ISBN 1-58765-008-8. ^ "Bobby Allison". NASCAR's 50 Greatest Drivers. NASCAR. Archived from the original on 24 March 2012. Retrieved 30 September 2012. ^ a b "A Race Without A Winner". Grand National East. Retrieved 2015-01-20. ^ Anderson, Lars (July 25, 2007). "Pushing the envelope: NASCAR has a proud history of tweaking the rules". SI.com. Time. Archived from the original on May 13, 2009. Retrieved May 13, 2009. ^ a b c Holmes, Heath. "Hut Stricklin's Racing Bio and Stats". HutStricklin.net. Archived from the original on May 13, 2009. Retrieved May 13, 2009. ^ "Meet the Inductees l NASCAR Hall of Fame - 2011". ^ Hembree, Mike (December 19, 2015). "Judy Allison, matriarch of cornerstone NASCAR family, dies at 74". USA Today. Gannett Satellite Information Network, Inc. Retrieved December 20, 2015. ^ "Bobby Allison – 1961 NASCAR Grand National Results". Racing-Reference. Retrieved January 7, 2015. ^ "Bobby Allison – 1965 NASCAR Grand National Results". Racing-Reference. Retrieved January 7, 2015. ^ "Bobby Allison – 1966 NASCAR Grand National Results". Racing-Reference. Retrieved January 7, 2015. ^ "Bobby Allison – 1967 NASCAR Grand National Results". Racing-Reference. Retrieved January 7, 2015. ^ "Bobby Allison – 1968 NASCAR Grand National Results". Racing-Reference. Retrieved January 7, 2015. ^ "Bobby Allison – 1969 NASCAR Grand National Results". Racing-Reference. Retrieved January 7, 2015. ^ "Bobby Allison – 1970 NASCAR Grand National Results". Racing-Reference. Retrieved January 7, 2015. ^ "Bobby Allison – 1971 NASCAR Winston Cup Results". Racing-Reference. Retrieved January 7, 2015. ^ "Bobby Allison – 1972 NASCAR Winston Cup Results". Racing-Reference. Retrieved January 7, 2015. ^ "Bobby Allison – 1973 NASCAR Winston Cup Results". Racing-Reference. Retrieved January 7, 2015. ^ "Bobby Allison – 1974 NASCAR Winston Cup Results". Racing-Reference. Retrieved January 7, 2015. ^ "Bobby Allison – 1975 NASCAR Winston Cup Results". Racing-Reference. Retrieved January 7, 2015. ^ "Bobby Allison – 1976 NASCAR Winston Cup Results". Racing-Reference. Retrieved January 7, 2015. ^ "Bobby Allison – 1977 NASCAR Winston Cup Results". Racing-Reference. Retrieved January 7, 2015. ^ "Bobby Allison – 1978 NASCAR Winston Cup Results". Racing-Reference. Retrieved January 7, 2015. ^ "Bobby Allison – 1979 NASCAR Winston Cup Results". Racing-Reference. Retrieved January 7, 2015. ^ "Bobby Allison – 1980 NASCAR Winston Cup Results". Racing-Reference. Retrieved January 7, 2015. ^ "Bobby Allison – 1981 NASCAR Winston Cup Results". Racing-Reference. Retrieved January 7, 2015. ^ "Bobby Allison – 1982 NASCAR Winston Cup Results". Racing-Reference. Retrieved January 7, 2015. ^ "Bobby Allison – 1983 NASCAR Winston Cup Results". Racing-Reference. Retrieved January 7, 2015. ^ "Bobby Allison – 1984 NASCAR Winston Cup Results". Racing-Reference. Retrieved January 7, 2015. ^ "Bobby Allison – 1985 NASCAR Winston Cup Results". Racing-Reference. Retrieved January 7, 2015. ^ "Bobby Allison – 1986 NASCAR Winston Cup Results". Racing-Reference. Retrieved January 7, 2015. ^ "Bobby Allison – 1987 NASCAR Winston Cup Results". Racing-Reference. Retrieved January 7, 2015. ^ "Bobby Allison – 1988 NASCAR Winston Cup Results". Racing-Reference. Retrieved January 7, 2015. ^ "Bobby Allison – 1982 NASCAR Budweiser Late Model Sportsman Series Results". Racing-Reference. Retrieved January 7, 2015. ^ "Bobby Allison – 1983 NASCAR Budweiser Late Model Sportsman Series Results". Racing-Reference. Retrieved January 7, 2015. ^ "Bobby Allison – 1984 NASCAR Busch Grand National Series Results". Racing-Reference. Retrieved January 7, 2015. ^ "Bobby Allison – 1985 NASCAR Busch Grand National Series Results". Racing-Reference. Retrieved January 7, 2015. ^ "Bobby Allison – 1986 NASCAR Busch Grand National Series Results". Racing-Reference. Retrieved January 7, 2015. ^ "Bobby Allison – 1987 NASCAR Busch Grand National Series Results". Racing-Reference. Retrieved January 7, 2015. ^ "Bobby Allison – 1988 NASCAR Busch Grand National Series Results". Racing-Reference. Retrieved January 7, 2015. ^ "Bobby Allison – 1974 IROC Results". Racing-Reference. Retrieved January 7, 2015. ^ "Bobby Allison – 1975 IROC Results". Racing-Reference. Retrieved January 7, 2015. ^ "Bobby Allison – 1976 IROC Results". Racing-Reference. Retrieved January 7, 2015. ^ "Bobby Allison – 1979 IROC Results". Racing-Reference. Retrieved January 7, 2015. ^ "Bobby Allison – 1980 IROC Results". Racing-Reference. Retrieved January 7, 2015. Wikimedia Commons has media related to Bobby Allison.